So far, we have focused on the physical aspects of the Carolan guitar. What kind of guitar might it be? What kinds of patterns should decorate it? And how could these be embedded into its wood? We also need to consider its digital characteristics. Our aim is to create a guitar that tells its own lifestory. But what might this include? Or more technically, what information should appear in our guitar’s ‘digital footprint’? An obvious starting point is the story of its creation; the many details of how and why it was designed and built that we are capturing in this blog. 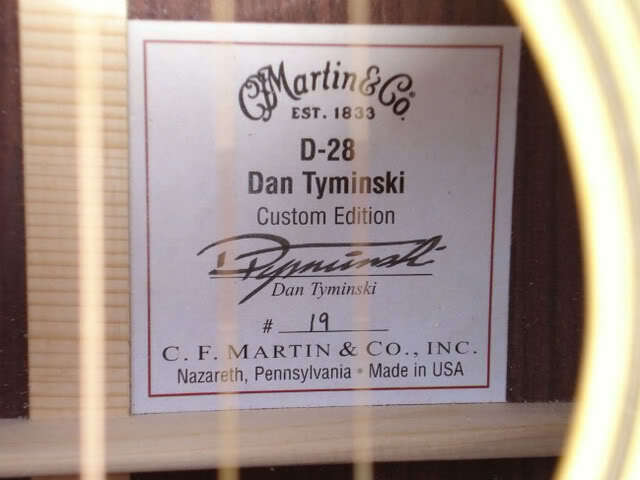 This reaches far beyond the standard provenance information that comes with any guitar – the maker, model and serial number that are often found on the maker’s label inside the sound hole – to include a rich documentation of this individual guitar being made. Such documentation is of technical value to be sure. Anyone who sets-up or repairs the guitar may wish to know details of its internal structure: how is the neck jointed? what is the truss rod like? where exactly is the bracing under the soundboard? This documentation will also be of interest to owners who may wish to know whether a potential purchase is still in its original state or whether it has since been modified. Beyond this, guitar magazines routinely feature reports of workshop visits and interviews with luthiers revealing details of their craft and individual approaches. Extending such accounts with photos, videos and specifications that describe the making of a specific individual guitar will surely be of interest to potential owners too. Another important aspect of provenance concerns the sustainable sourcing of wood. The highest quality guitars have traditionally been made from increasingly rare tonewoods, several of which now appear on lists of endangered species. As a result, guitar manufacturers are increasingly focused on sustainable manufacture, in part driven by legislation such as the CITES and Lacey acts that control the import and export of endangered species. Guitar owners also need to be aware of the implications of this legislation which potentially prohibits them from reselling vintage guitars made from protected tone woods, from carrying these guitars across international borders, and possibly even from displaying them in public. The guitar press has recently reported instances of the German police confiscating vintage guitars that were advertised on eBay, and one possible horrendous fate for such guitars is to be destroyed! There are even suggestions that guitars may require ‘guitar passports’ before they can be taken abroad in the future. For anyone interested in learning more about the challenges of sustainability and tonewoods, we highly recommend watching the excellent feature-length documentary Musicwood that tells the story of a confrontation between Greenpeace, guitar makers Gibson, Taylor and Martin, and native-American logging corporations in Alaska. It’s a terrific – if ultimately depressing – account of the complex economic and political issues involved. Broadening our perspective further, the digital footprint of our guitar could extend far beyond its manufacture to also include its unfolding story as it enters the world and passes among players. The outrageous prices of famous guitars, from early prototypes to those played by famous people, testify to the value that such stories can add in extreme cases. 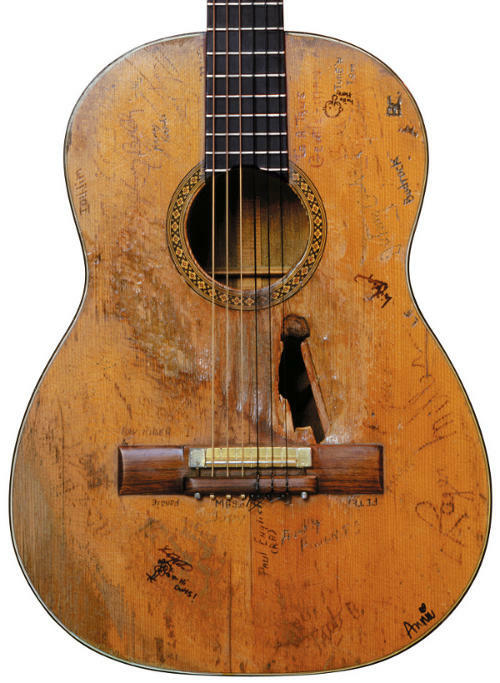 As just one example, Bob Dylan’s famous electric guitar sold for nearly $1M back in 2013. The strength of the market for vintage guitars in general, suggests that capturing histories of ownership and use might add value to a many more everyday guitars as they ultimately become collectable vintage items on reaching twenty-five years of age. Finally, but perhaps most importantly of all, capturing the personal stories of guitars may enhance their owners’ personal relationships with them. No matter whether that are a famous or everyday musician, a player’s personal relationship with their guitar can be both longstanding and also deeply personal, encapsulating memories of learning to play, continually trying to master the instrument, and connections to friends, fellow band-members, teachers and those who have handed it down. Steve, for example, still possesses almost every guitar he has ever owned (as Penny will confirm if asked), from the first cheap three-quarter sized nylon-strung acoustic his father brought him to learn on, to the Gibson SG copy electric that he saved up to buy from his Saturday job as a teenager. What if these guitars were linked to recordings of his earliest lessons or performances? Ultimately, the greatest value of the digital footprint may lie in enhancing the personal memories associated will many millions of everyday instruments. 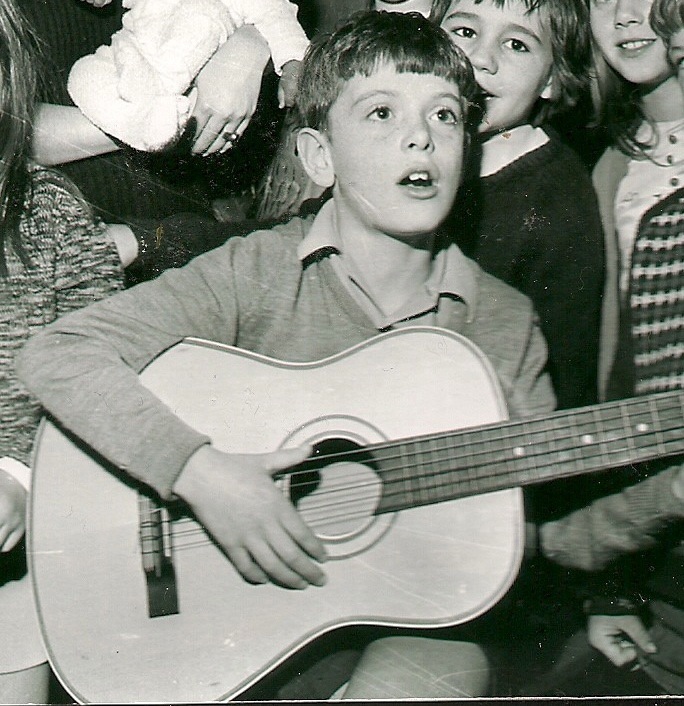 An early memory of Steve playing his first guitar circa 1973. The venue was Fulbourn Village Hall. The event was probably a local fete. The song was certainly Puff the Magic Dragon. The ‘fans’ were likely bribed with promises of appearing in the Cambridge Evening News by a passing reporter. In short, it appears that guitars may have especially complex digital footprints, spanning technical documentation and official provenance, but also encapsulating personal recollections and connections. The aim of our project – and a key challenge for the next stage of our design – is to explore how these different kinds of information might be associated with the Carolan guitar through various patterns that decorate different parts of its structure.